It may not be time for spring as far as the flowers in your garden are concerned (even during a mild winter), but with this set of Garden Cookie Cutters you can get spring started in the comfort of your kitchen. These cookie cutters are some of the cutest cutters I’ve seen in a long time because the plastic is shaped just like the finished cookies. 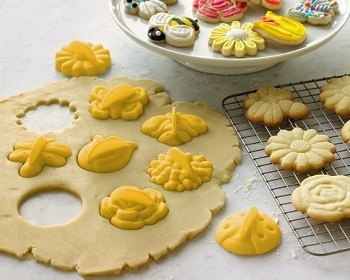 The cutters punch out very detailed cookies not just the outlines of cookies – in eight different designs, including a rose, daisy, tulip, dahlia, ladybug, butterfly, bumble bee and dragonfly. They’re easy to grip and kids will have just as much fun with them as adults, especially since the plastic handles are more kid-friendly than you’ll find on some cookie cutters. Once the cookies have baked, you can serve them as-is and enjoy the look of the plain designs. You can also whip up some colored frosting and fill in the details on the cookies for a more colorful array. As always with cookies like this, I recommend using a homemade butter cookie dough that won’t spread too much so that you preserve as much of the design as possible after baking, rather than using store-bought sugar cookie dough which will still work, but typically spreads enough that you lose some of the finer details from cookie cutters like these. 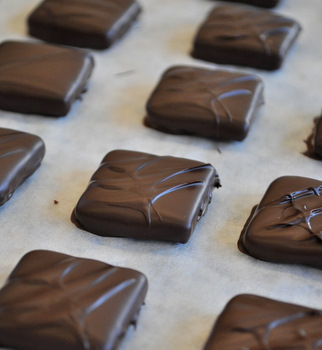 What does it mean to temper chocolate? Previous PostPrevious What does it mean to temper chocolate?